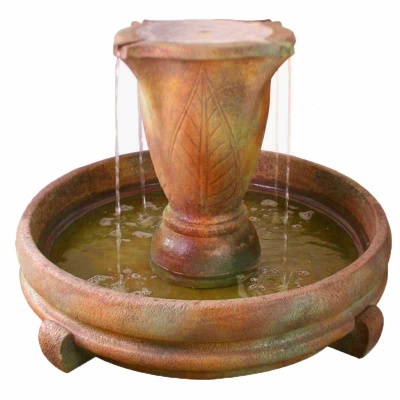 Henri Studio Overflowing Vase Fountain Water Feature promises an inspired outdoor garden fountain that has been hand finished in Relic Nebia weathered colours by renown Henri sculptors. A vase and fountain sculptured in cast stone combined into one exceptional hand painted detailed garden water feature, providing lasting garden memories. Water falls romantically from the vase rim, falling into the lower basin, creating a sound that simply unites our natural senses. Water is recycled again and again through the lower fountain, through the vase and spilling again from the vase using Henri Studios re-circulating pump (included). No mains water connection required.